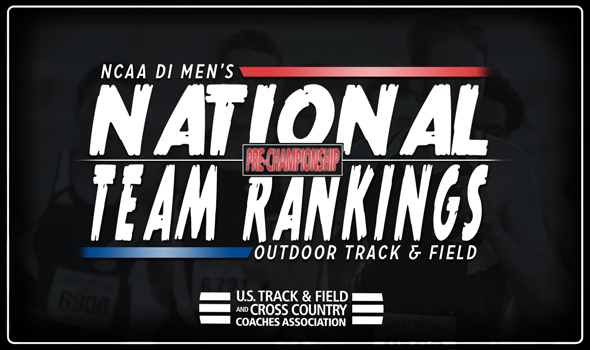 NEW ORLEANS – Quantity and quality was rewarded by the NCAA Division I Men’s Outdoor Track & Field Pre-Championships National Team Rankings. Florida – which secured the most entries into the 2018 NCAA Division I Outdoor Track & Field Championships (17) and has the most top-ranked entries, at that – enters next week’s championship meet as the favorite. The Gators, who have been the top-ranked team in the nation each of the past nine weeks, have only been ranked first this late in the season twice now. Texas Tech sits a distant second behind Florida with Georgia and Alabama hot on its heels. The Red Raiders and the Bulldogs are separated by just 0.40 points in their best rankings this late in the season in program history, while a meager 0.31 points is the difference between the Bulldogs and the Crimson Tide. Texas A&M comes in at No. 5, which is its lowest billing in the Pre-Championships Rankings since the National Team Rankings were introduced in 2008. Let’s turn our attention back to the Gators, who are looking to become the sixth program with back-to-back-to-back outdoor titles in NCAA Division I history. None of those titles have come easy for Florida as it won by six points in 2016 and two points last year. The Gators have seven entries ranked in the top-5 nationally, including four that feature Grant Holloway directly. Holloway is the top-ranked athlete in the 110 hurdles, ranked No. 2 in the long jump and is part of the top-ranked 4×400 relay and the third-ranked 4×100 relay teams. Holloway is joined in top-5 distinction by Clayton Brown in the high jump, KeAndre Bates in the triple jump and Anders Eriksson in the hammer throw. Texas Tech is led by five entries ranked in the top-5 nationally – nine if you extend it out to the top-10. Three of those top-5 national marks come in field events with Trey Culver in the high jump and both Charles Brown and Odaine Lewis in the long jump. If you’re talking total entries to NCAAs, the Red Raiders are looking at 12 – tied for third most with Texas A&M. Georgia matches Florida in terms of quality, but not quantity. The Bulldogs also bring seven top-5 entries to Historic Hayward Field, two of which belong to Denzel Comenentia (shot put and hammer throw) and Kendal Williams (100 and 200). Where Georgia falls behind the Gators is the sheer number of NCAA entries: The Bulldogs only have 10. Alabama, specifically its distance runners, shined at the NCAA East Preliminary Round. The Crimson Tide trio of Alfred Chelanga, Gilbert Kigen and Vincent Kiprop qualified in both the 5000 and 10,000. That counts for six of Alabama’s 14 NCAA entries, while Dan Waters’ team spreads the others out in the sprints (1), hurdles (1), jumps (2) and throws (4). Texas A&M owns just three top-5 entries: Tahar Triki (No. 1 in the triple jump), Devin Dixon (No. 3 in the 800) and the third-ranked 4×400 relay. The Aggies amassed 12 total entries in all, but the biggest omission was 2017 javelin champ Ioannis Kyriazis, who failed to qualify. Oregon is billed sixth in the Pre-Championships Rankings, followed by seventh-ranked BYU, eight-ranked LSU, ninth-ranked Houston and 10th-ranked Florida State. These are the best rankings this late in the season for both of the Cougars.